The word “kawaii” means “cute” in Japanese, and cuteness has a status in Japan that’s a little hard to comprehend until you’ve experienced it firsthand. In the US, it sometimes seems that cuteness, or having an appreciation for cute things, is considered juvenile. But in Japan, there’s no shame in loving the “kawaii,” no matter what your age. Courrier service Kuroneko Yamato’s log is a mama kitty carrying a kitten in her mouth. Kawaiiiii!!!! Most people know Hello Kitty and other Sanrio characters like My Melody and Little Twin Stars, but the admiration for animated characters goes waaaaay beyond that. Everything from consumer goods companies to landmarks to governmental organizations has a cartoon mascot. The Tokyo Police force is represented by a little mouse! 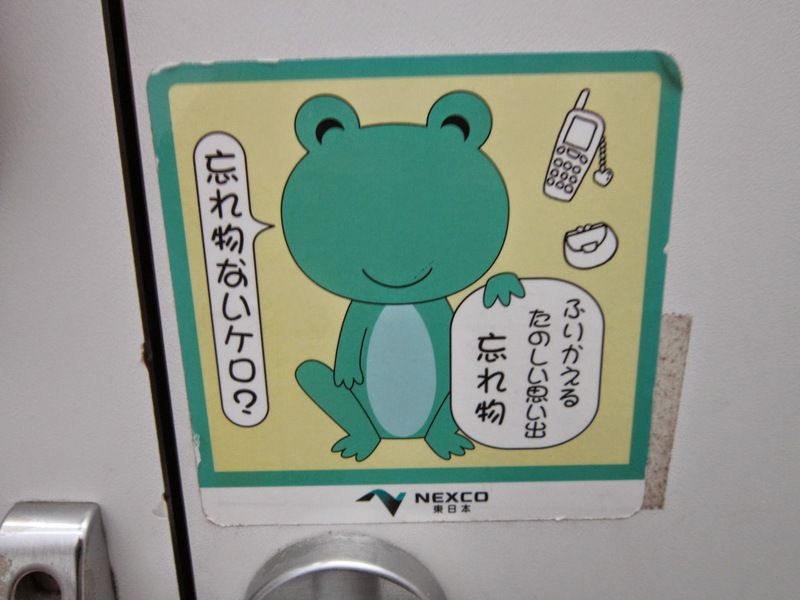 This cute little frog cartoon is reminding you not to forget any items on the train. It’s probably possible to write an entire dissertation on kawaii things to do in Japan, and maybe someone has already done that! But in this post, I just want to share a few of the highlights that I’ve experienced firsthand. For anime addicts and manga mavens, Tokyo doesn’t disappoint. Head to the fashionable Omotesando shopping district to pay a visit to Kiddyland. Nestled between outposts of major labels like Chanel and Louis Vuitton, this superstore is five floors of toys and other amusements. Find all your favorite characters ranging from Snoopy to Star Wars—plus a few limited edition Hello Kitty items. If you love the mystical worlds of director Hayao Miyazaki (creator of classic animated films like Spirited Away and My Neighbor Totoro), you won’t want to miss the Ghibli Museum. Think self-guided Disneyland meets cabinet of curiosities and you won’t be far off. Note that you’ll need to secure tickets ahead of time. 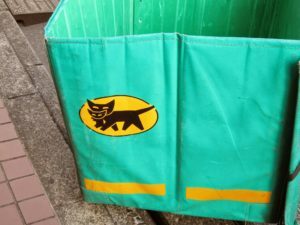 While you’re in Japan, you can purchase them at Lawson convenience stores, and the Ghibli Museum website offers detailed instructions on how to do this. Electronics district Akihabara was once considered the hotbed of otaku culture (and you can still definitely head here for the latest in electronics, manga, and maid cafés), but Nakano Broadway is the new nerdy-cool kid on the block. This indoor shopping arcade features small stalls that cater to every hobby and obsession—you can easily spend hours sifting through the classic toys, antiques, records, figurines, and more. If you love Hello Kitty & friends as much as I do, you may want to schedule in some time to stop by Puroland, the Hello Kitty theme park. However, be warned, it’s definitely more child-oriented than other theme parks like Disneyland and Disney Sea. My friend and I felt slightly out of place as the only adults who were there without children. In Harajuku, the epicenter of youth culture in Tokyo, you can find all sorts of ways to spend your time and money. There are rainbow-colored mountains of cotton candy, ooey gooey crêpes filled with everything from strawberries and nutella to sweet bean paste to pudding, stores that specialize in the trendiest dog fashions, and tons of used clothing stores. 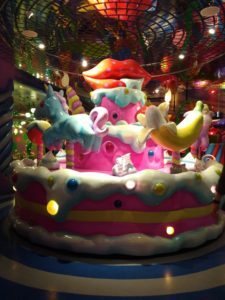 But one of my favorite experiences in Harajuku was the Kawaii Monster Café, an elaborately decorated restaurant that caters to all your kawaii monster needs. 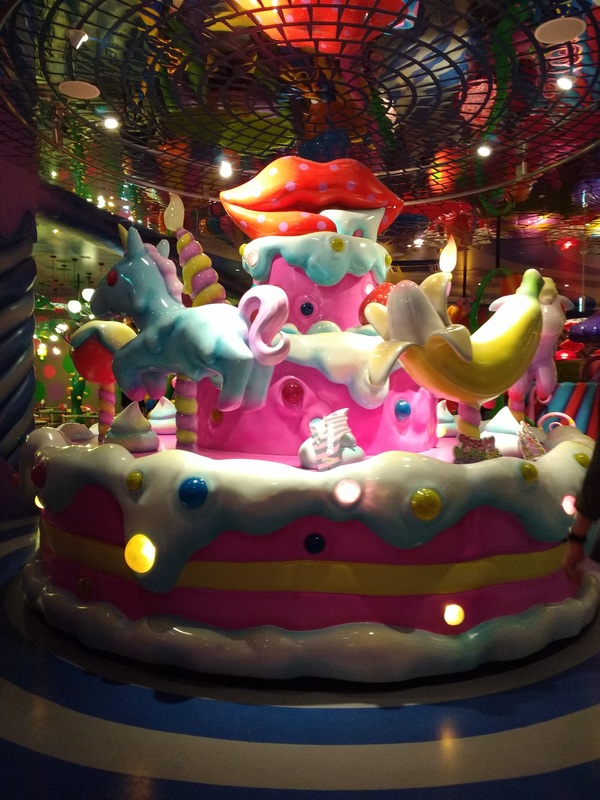 The “sweets-go-round” at Kawaii Monster Café. You can experience a perfect blend of traditional Japanese and modern pop culture at the Hello Kitty Saryo in Kyoto. 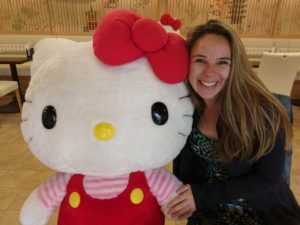 I already dedicated a full blog post to this topic, but the highlights included a life-size Hello Kitty doll that joined me at my table, tranquil views of a traditional Japanese garden (with some Hello Kitty touches), and Hello Kitty-inspired desserts and drinks. Hanging with my bestie at Hello Kitty Saryo in Kyoto. 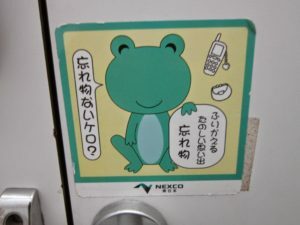 Have you had any kawaii experiences in Japan? Drop me a line in the comments to let me know!